Day 9 of OILD and it’s time for some reflection. Every year around this time, I get to thinking about not just the history TSG has, but about the future too. Next year’s going to be huge! We’ve got some big ideas for our first-ever week-long Zelda marathon and trust me, you will not want to miss that. Everything’s hush-hush for now, but in 2016 you’ll hear all about it. And that’s why today’s ice level is the Ice Palace, from The Legend of Zelda: A Link to the Past! Link to the Past is one of the most beloved Zelda games, and it’s not hard to see why. The game really added to the lore of the series, introducing the concept of multiple worlds and adding dimensions to the Triforce’s power. It was said that Ganon’s evil heart used the Triforce for his own gain, thus corrupting the sacred Golden Land into the twisted and dangerous Dark World. All who enter are never heard from again, but when the young Link hears Princess Zelda’s call for help, he has to venture into the darkness to save Hyrule. The Ice Palace is one of the many dungeons in ALttP, and it stands out in my mind as being one of the more notoriously complicated ones. I remember having a real hard time figuring this one out as a kid, so I have this weird instinctual nerd fear of it, haha. 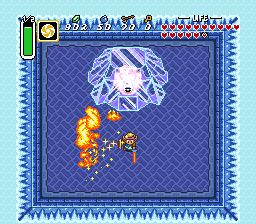 A lot of these rooms have ice physics and pits, which is always a wonderful combination, especially since Link doesn’t jump. Ice physics are also great for rooms full of Pengators, adorable bitey-mouth penguin/alligator-looking things that love to slide around and attack you. There are also Zols, Freezors, and Stalfoses, but lucky for you, there’s also the Blue Tunic, which improves your defenses. The boss of this dungeon is Kholdstare, a giant, fluffy eyeball monster. Kholdstare is originally hanging out inside a giant ice block, but the Fire Rod or the Bombos Medallion will make short work of that. 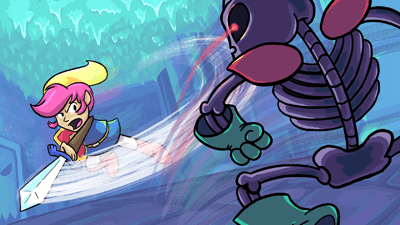 Once the monster is freed, it’ll split into three clones and fly around the room, dropping ice blocks on you nonstop. You have to attack all of the Kholdstare clones to win, but you’re up to the challenge, right? Yeah I made everything look more like their in-game sprites! What of it?! The full wallpaper’s HERE! And now for some music! The Ice Palace from Link to the Past doesn’t have a unique song, but I still have some Zelda tracks for you! Let’s start off with something cheerful, like say, the Snowhead Temple from Majora’s Mask–err, wait no… that music’s super creepy and weird… okay well, how about the Majora’s Mask 3D version? Uh no… that’s also creepy… Oh wait! I got it! What about Yeta, that adorable Yeti from Twilight Princess? She’s not scary at aAAAOOHH MY GOD OKAY BAD IDEAS BAD IDEAS POOR CHOICES! Uh here’s the music, anyway… Okay so at least the Ice Ruins from Link Between Worlds is only vaguely creepy, right? Jeez, is there ANY ice song from Zelda that doesn’t make you think of disturbing frozen elf corpses sliding around your house and asking you to play with them forever? Okay, I guess the Frozen Hyrule music from Four Swords Adventures is all right… though it is just a remake of the Dark World theme from Link to the Past. But hey, thematically appropriate, I guess! Remix time! The Electric Flute is a Frozen Hyrule remix by halc, and SonicWave1000 did this remix of OH NO BLIZETTA’S BACK RUN FOR IT YOU GUYS!! !